One of our favorite elements of any telenovela is the opening credits. Not only are we able to see the names of the actors and crew behind the production, we are also able to attach a theme song to it. Music evokes nostalgia and when a soap is engraved in your mind, the theme song is what brings it back to you. A good mix of catchy lyrics and good graphic elements paired with imagination make the intro of a telenovela compelling. 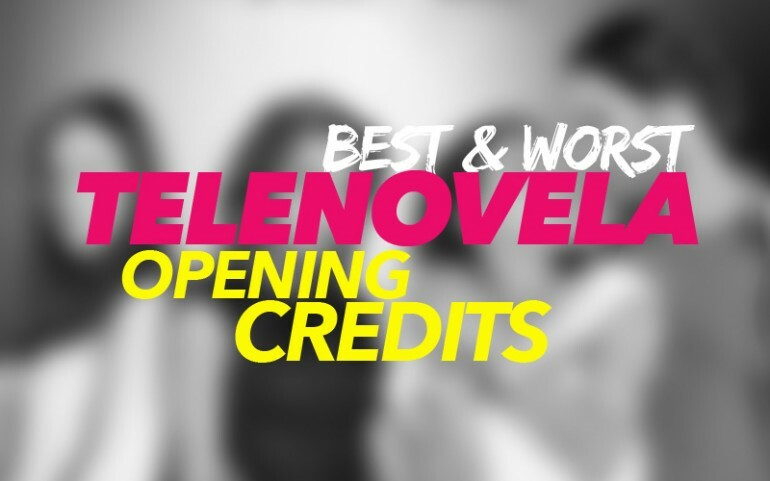 Read as we rank the current Univision and Telemundo opening sequences from BEST to WORST. 1. "Yago" - This intro is by far our favorite as it is completely original. We have no scenes from the show cut up, it is all computer animated. The theme song is suspensful just like the series, which adds more power to it as it relates to the main storyline. 2. "El Señor De Los Cielos" - Every season, a new "corrido" is made that tells the story of the season. Aurelio Casillas is a kingpin and just like the drug lords in real life, inspires songs about the tales people talk about. It is a reflection of what the series is and how it relates back to the real world. Creators added elements over cut scenes that add more value and makes viewers appreciate the creation behind the opening credits. 3. "Tres Veces Ana" - The newly released telenovela has a Pablo Alborán theme song. Yes, it is a lazy intro with a boring font for the credits. At the same time, it is a classic drama series and has that to its defense. That is no excuse for creatives to just throw up something together like this. What really saves it is the lovable tune. 4. "Sueño De Amor" - For some reason that we do not understand yet, creators of these opening credits opted to make the images black and white. Those scenes are interluded with the music video from Shakira and Maná of the song that gives life to the drama series. The tune is beautiful, but it is just quite odd because it does not really relate back to the original storyline. It makes it seem that the producer only wanted to have big names attached for his project. 5. "Eva La Trailera"​ - The theme song is not to our liking, although we understand what the creators were trying to do. It does not scream back at us "telenovela theme song." We do appreciate the graphic elements over the edited scenes. It adds a touch to it, instead of just cutting scenes together. 6. "La Esclava Blanca" - This Colombian production has a boring intro, but to be fair, it does have beautifully shot images and allows us to appreciate the scenery more. We would have loved a little more thought process to go behind it, just as much went into selecting the locations and writing the wonderful script. 7. "Un Camino Hacia El Destino"​ - Sorry to say that this is just garbage. There was no imagination for this intro. We understand that she plays the violin and that's cute, but we just cannot forgive the fact that the intro is just scenes that were cut together. It seems lazy and unimaginative.